I’ll get into further details involving all these points below with graphics to illustrate these points. First, I need to explain some of Avraham Gileadi’s Isaiah research. 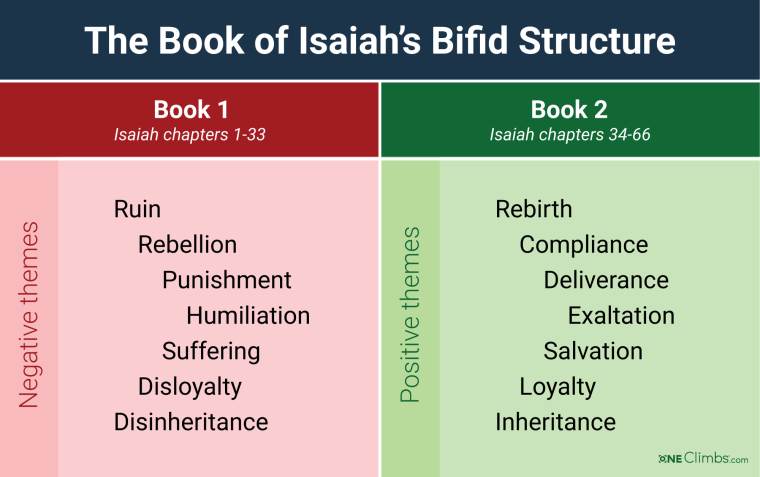 In his fantastic book, The Literary Message of Isaiah, Gileadi begins by explaining the “Bifid Structure” of Isaiah that he says was discovered by William H. Brownlee. A study of the Dead Sea scroll of Isaiah led Brownlee to propose “that Isaiah can be divided into two halves or ‘books,’ one consisting of Isaiah 1-33, the other of Isaiah 34-66.” (p.2) He discovered “seven categories of parallel subject matter in each” (p.2), and that formed the springboard for Gileadi’s doctoral thesis. The seven categories are made up of pairs of antithetical themes that climax with humiliation and exaltation (p.7). To further help visualize this Bifid Structure, I created the following graphic to illustrate further how these opposing themes emphasize negative or positive context. This is only scratching the surface of Gileadi’s research and I encourage an exploration of the literature that he has published if you have an interest in the words of Isaiah, especially his translation of Isaiah which is available for free. Next, I’ll detail some of these things I’ve found. I began this whole thing by creating a spreadsheet in Google Docs with the books of Isaiah in chronological order, colorized the Bifid Structure, and then identified the themes. 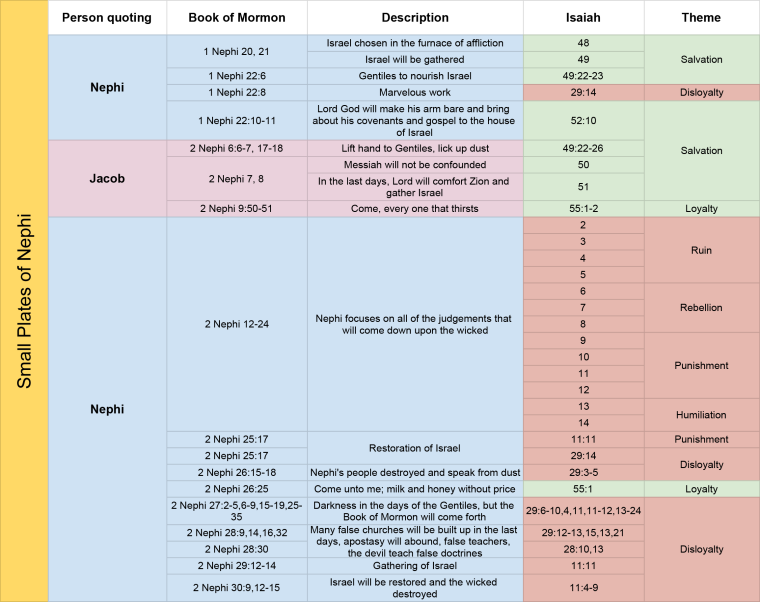 Next, I identified all of the references to Isaiah in the Book of Mormon and placed them in another column next to corresponding Isaiah chapter. In another column, I put the name of the individual who was referencing Isaiah in that instance. The result is that we can view the Book of Isaiah regarding how individuals in the Book of Mormon quote from it. 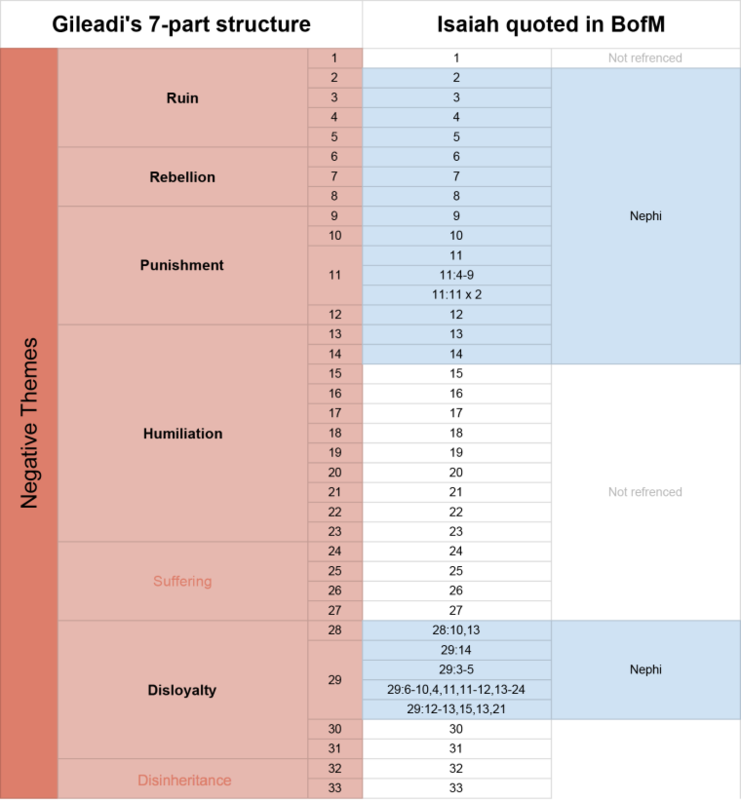 As we can see, the first 33 chapters of Isaiah are dominated by Nephi. He is most focused on the chapters that related to Gileadi’s themes of ruin, rebellion, punishment, humiliation, and disloyalty. Nephi quotes entire chapters back to back, and it appears that he is very concerned with these judgments of God. He has seen the fall of his people, and I wonder how much of his preaching was influenced by these verses in helping his brothers and the rest of his family return from their apostasy. Based on the Isaiah passages he quotes, disloyalty is also a big concern of Nephi at the end of 2 Nephi in his commentary on the fall of his people and the last days. What I discovered next really blew me away, it is by far my favorite discovery to come out of this exercise. In “Book 2” of Isaiah, something astounding jumps out at you; there is a lot of activity around the salvation and loyalty themes in Isaiah 48-55. As I added the color coding for the individuals who are quoting Isaiah, I noticed a distinct pattern. I included the priests of Noah in there because they technically quote Isaiah, but they intended to confound a prophet of God and maintain their wicked state rather than teach anything of value. Below, I have extracted the names and indented them so you can see the chiastic structure. First, I want to point out the Jesus/Moroni parallelism that occurs here. The Book of Moroni is not part of Mormon’s abridgment, but it is satisfying to observe how Moroni’s final words echo the same Isaiah chapters as Jesus. No offense to Moroni here, but I’m going to pull his name out of the chiasm to narrow the scope strictly to Mormon’s abridgment. These two prophets, Jacob and Abinadi both quote from the salvation themed chapters of Isaiah. Jacob is parallel to Nephi as Abinadi is to Jesus Christ in this chiastic structure. The structure of the chiasm itself both begins and ends with Nephi. At the crux of all these references is a single verse, Isaiah 52:10 which reads: “Jehovah has bared his holy arm in the eyes of all nations, that all ends of the earth may see our God’s salvation.” (Isaiah Institute Translation) According to Gileadi, the arm and salvation referenced in that verse are referring to the Jehovah’s end-time servant and Jehovah God of Israel respectively. If we break the chiasm into two parallel parts using Nephi as the beginning and end of each segment, Jesus becomes the central figure flanked by Jacob and Abinadi. The next portion of my study involved taking a chronological look at the Book of Mormon and identifying all of the references to Isaiah. I split the Book of Mormon into its two main sections, the small plates of Nephi and Mormon’s abridgment. 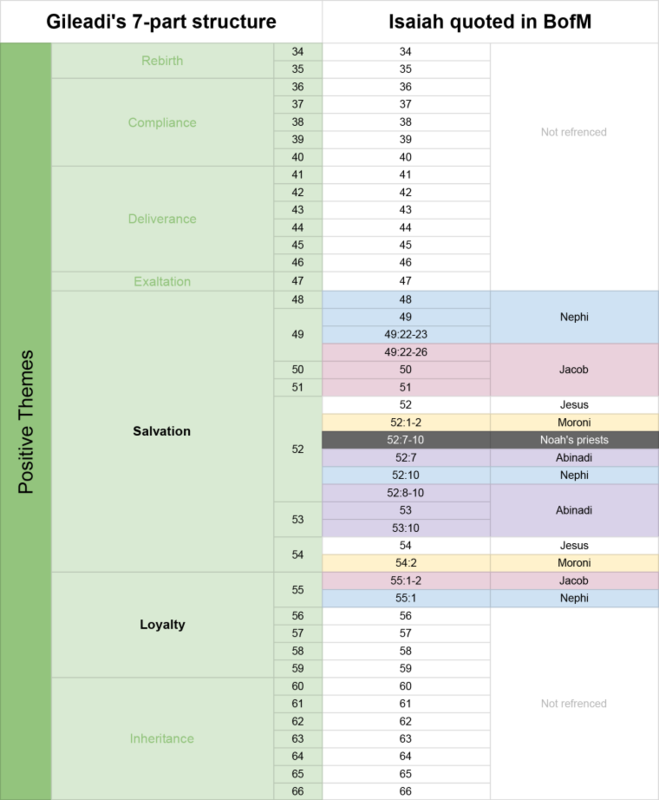 Doing this visualizes a significant division in how Isaiah is used. The charts below identify the person referencing Isaiah, the location in the Book of Mormon, the location in Isaiah and associated theme. The first thing you will notice is that Nephi dominates when it comes to references to Isaiah. Initially, he and his brother Jacob seem very focused on the salvation chapters except for one portion of the disloyalty theme by Nephi. After Jacob’s word, however, Nephi quotes heavily from the negative themes of Isaiah with one small jump to the loyalty portion. Nephi never had a problem speaking with ‘sharpness’ to his brothers and was never afraid to proclaim the consequences of sin boldly. From the fall of Laban to his brothers’ rebellion, he saw the price of disloyalty, pride, and faithlessness. In 1 Nephi where Nephi is quoting from the salvation chapters of Isaiah, they have just arrived in the promised land. Up to this point, all of God’s promises have were fulfilled, and everything is going well. It is a time of rejoicing, and so it isn’t surprising that he seems drawn to these chapters of Isaiah that are salvation-themed. Jacob starts quoting Isaiah in 2 Nephi after Lehi’s passing, their separation from the Lamanites, and construction of a temple. Again, they are happy and prospering for the most part and so it makes sense that Jacob finds the salvation and loyalty chapters of Isaiah meaningful. Then Nephi picks up again after Jacob and devotes a significant portion of his record to direct quotations from the ‘negative’ themes. He isn’t pessimistic though; he even says in chapter 12 before he digs into Isaiah “And now I write some of the words of Isaiah, that whoso of my people shall see these words may lift up their hearts and rejoice for all men.” (2 Nephi 11:8) Nephi and Jacob are very similar in that they are fearless in boldly pointing out the dangers of sin. Compare these two references from Nephi and Jacob and notice their similarities in attitude. I think that in 2 Nephi we see a stark contrast to Jacob’s words. Nephi saw the downfall of his people and what caused it. My theory is that he trusts in the power of Isaiah’s words to sufficiently warn future generations and save them from an awful fate. saying to Zion, Your God reigns! when Jehovah returns to Zion. Abinadi came to them prophesying of their destruction if they didn’t repent and they took offense at his apparent ‘doom and gloom’ message. The priest was seeking to denounce Abinadi for not bringing them peace or tidings of good. Abinadi then widens the scope of those verses to explain that although his message seems harsh, it IS a message of peace and good tidings, it is a call to repent and be redeemed. Only Alma gets it though, the rest reject Abinadi, and he was martyred. Jesus himself so values Isaiah’s words that he quotes almost all of chapters 52 and 54. What I find interesting is that he skips over chapter 53 which contains many allusions to his own mortal life on earth. In quoting from 52 and 54, the chapters that flank 53 on each side, he almost seems to be stepping over 53 and focusing on the victory he has won since his mortal life and sufferings are now behind him. I feel like I have only scratched the surface at this point. A much deeper analysis of the relationship between the Book of Mormon and the Book of Isaiah. I hope my observations can help add to that study and possibly provide a method for analyzing other scriptures that are quoted by individuals in the Book of Mormon. Moses and the delivery of the children of Israel from the Egyptians is another major theme that recurs and deserves further investigation. If you would like to view the original spreadsheet that I may update from time to time, you can click here.